Added by Indo American News on November 17, 2016. 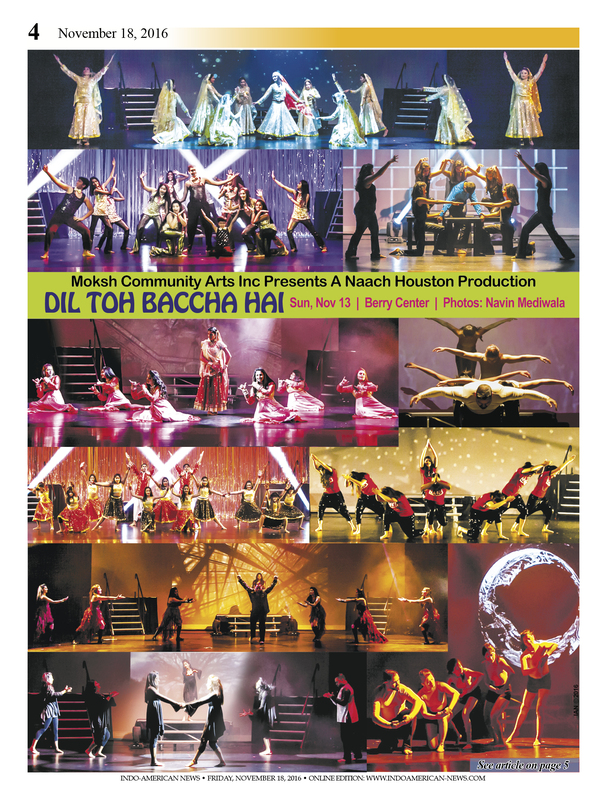 A mesmerizing Production , from Artistic Director, Mahesh Mahbubani and the Amazing Naach Faculty Anita Vyas, Shah Ahmed, Zohair Alam, Prita Kapoor, Nirju Tailor, & Disha Thadani. A packed house buzzing with excitement, waiting to witness another World of Magic , Music , Dance, Theatre, woven into an emotionally and creatively charged hi energy production. Over 100 Performers waiting in the wings in their first costume, Happy faces with excitement coursing through the veins, Energy waiting to be unleashed into a memorable performance. “Dil toh Baccha Hai” as the title suggests is set around the idea that the heart is always young. This dance show case featured dancers as young as 4 years old and as old as 75 – all of them, young at heart, of course. Naach Houston’s recreational dance team along with the Naach Houston professional dance team performed four mesmerizing acts , interspersed with three student acts. Dil Toh Baccha Hai – a contemporary rendition exploring the issue of emotional child abuse and Superstar – a fun segment capturing the essence of being a superstar. 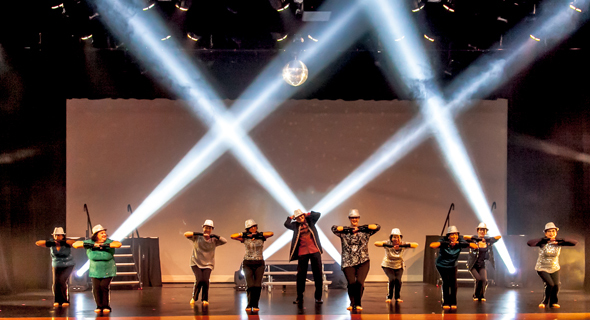 The show opened to a full house with the foot tapping “Muqabla” featuring Naach Professional dance team in red LED cowboy hats – a hint at cultural collaboration “The Texan Bollywood” , followed by the film credits. The first act, Mausam had theme based songs according to the season – Summer interpreted with Lets talk about love an Indo Jazz dance piece, followed by the Monsoons ‘ghanan ghanan’ from Lagaan inspired by folk dance styles , Winter interpreted through spaces within relationships, in contemporary dance style. Spring expressed its with “Saj Dhaj ke” lighting up the stage with vibrant performers. The student showcase that followed included songs ‘Chalak Chhalak’, ‘Chhota Baachha’ Love letter and ‘Aaj mein Upar’. Act 2 opened with Bhaag Milkha Bhaag ‘Maston Ka Jhund’ a high energy dance followed by a fluid Indian contemporary dance piece ‘Mohe Rang Do laal’ inspired by Kathak. The Piece was Performed exquisitely by Jaanvi Ramalingam . The Mood switched to ‘Gabru’ a typical Bollywood style choreography, to finish this act with the current favorite ‘High Heels’ from Ki & Ka, performed in hip hop dance style. The Third act the title act On emotional child abuse Awareness. Opening with Blue umbrella interpreting the innocent and happy nature of a child, followed by a stark and beautiful dance rendition of the title track Dil toh Baccha hai in contemporary style. Zohair Alam, from the Naach Theatre group, performed a moving monologue depicting emotional child abuse, his story, he spoke to the audience from his heart followed by Jagoo powerfully performed by Akash Shah , where he expresses the anguish and shame experienced by an emotionally abused child. Concluding this act , the dance Teri Baari, depicting his flight to success by following his heart’s desire. Moksh Community Arts’ outreach program taught by Mahesh Mahbubani at the T E Harman senior center sugar land, since 2104, featured the young-at-heart Senior Citizens. This act brought the audience to its feet with Ticket to Hollywood and Fabulous. The final act Superstars opened with ‘Jabra’, followed by the epic ‘Deewani Mastani’ performed with grace and elegance by Simki Palicha, with mesmerizing costumes and intricate choreography. Mahesh Mahbubani came on stage and thanked the audience, the Diamond sponsor Amiralli Dodhiya of New York Life,Our Platinum sponsors Manish and Manju Rungta of Rungta foundation,Vasu M Bommanna & Veena Vasudev of the Adult and Children Allergy& Asthma Center. A big thank you to our Media Sponsor – Indo American News. The finale featured all dances on stage moving in synergy to ‘Kaala Chasma’ with the audience chiming in with a tumultuous applause to wrap up the show. A Big Thank you to the The Amazing Technical Team : Lighting Designer, Mr. Arif Memon .Back Stage Management by Malay Vyas, Star Gilani, & Disha Thadani.